Two-basket (GBW1) and Four-basket (GWB2) capacity and 2 Tote (GWT1) and 4 Tote (GWT2) glassware solutions are offered in a space saving 18″x36″ footprint. Solid MetroMax bottom shelf provides spill retention and can be removed from shelf frame for easy cleaning. 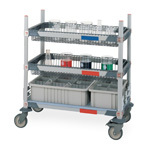 Glassware carts are built primarily from MetroMax advanced polymers, providing lifetime corrosion protection. Choose from a wide range of accessories, including all polymer casters for maximum corrosion resistance and premium performance. Units do not include casters. Choose from a wide variety of casters in our Metromax components accessories section under stem casters. 5PCX and 5PCBX are recommended. Two-basket (GBW1) and Four-basket (GWB2) capacity and 2 Tote (GWT1) and 4 Tote (GWT2) glassware solutions are offered in a space saving 18"x36" footprint. Solid MetroMax bottom shelf provides spill retention and can be removed from shelf frame for easy cleaning. Glassware carts are built primarily from MetroMax advanced polymers, providing lifetime corrosion protection. Choose from a wide range of accessories, including all polymer casters for maximum corrosion resistance and premium performance. Units do not include casters. Choose from a wide variety of casters in our Metromax components accessories section under stem casters. 5PCX and 5PCBX are recommended.